Dazzling Bridal Gown Designs for All Kinds of Indian Brides! Now who wouldn't want to look like a Disney princess on their wedding day? There ain't no bride who wouldn't want a bouncy, flouncy, layered and dreamy wedding dress with a gazzilion meters of fabric. After all, this is our big dress up day, right? And it is legitimate. The Indian wedding lehenga has gone through a metamorphosis and emerged a tad bit contemprory. The traditional cuts and silhouettes are now heavily influenced by bridal looks of the west - a.k.a. the Indian bridal gown. The gown seems to have taken centerstage in pre and post wedding functions. While brides still choose to wear elaborate lehengas for the ceremonial wedding, gowns have made an an entry as the favored garment for post wedding receptions, cocktails, sangeet ceremonies and engagement functions. Still keeping in trend with our traditional tastes, Indian bridal gowns are cut more conservatively and are high on embellishments in comparison to what we see in their western counterparts. Indian bridal wear designers like Sabyasachi, Manish Malhotra and Ritu Kumar are using their personalized aesthetics to create bridal gowns for the Indian bride, that'll suit her shape, her grace and her beauty. 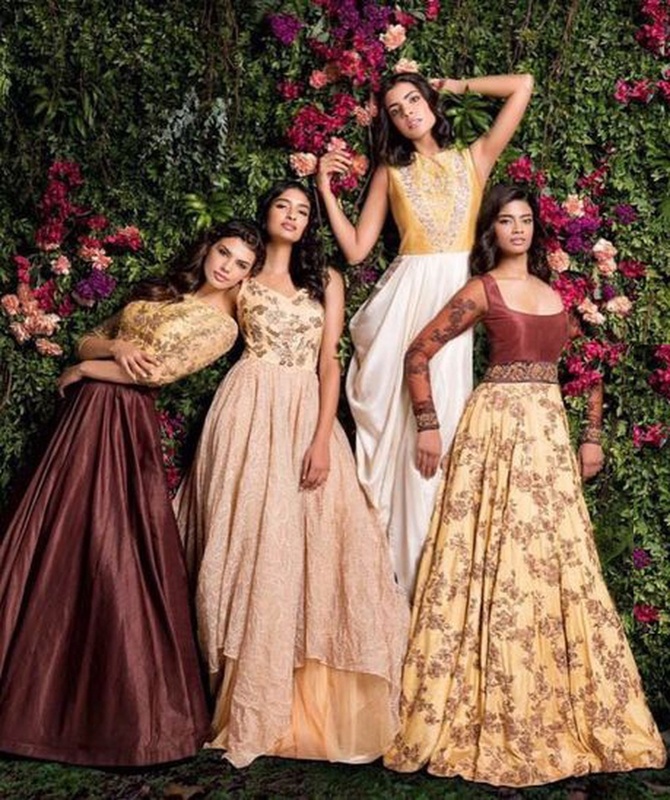 Today we highlight top four Indian bridal gown designers, who have transformed the meaning of ball gowns and evening gowns, giving them a new definition with their unusual take on design and construction. Take your pick. This Indian designer is known for his unusual take on silhouettes and structuring of garments. He works closely with lines and motion of fabrics and has an unmatched take on three-dimensional embroideries and volume that play a major role in bridal gown designs. His distinct garment construction and untempered experimentation with fabrics and forms make him a favourite of fashionistas looking for unique designs in the market. These Gujarat based designers have a strong passion for crafts and heritage. Shyamal & Bhumika’s brand has a signature style that involves deep research and revival of various dying arts and crafts that reflect in the intricacies of their collections. These breathtaking and stunning bridal gowns do not come cheap. They can easily cost you anywhere between Rs. 80,000 up to 2.5 lakh. If this is over your wedding budget, we suggest you pin these stunning design ideas right away and showcase your choice to local tailors who do a fab job at replicating such ace designer collections.